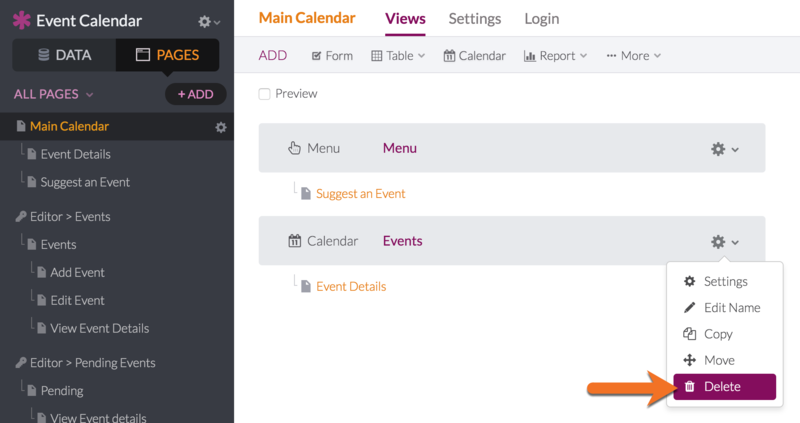 A calendar view is used to display multiple records from your database in a Calendar viewable from your live app. What do Calendars look like in the Live App? Calendars display multiple records from one of the objects in your database in a graphical calendar interface. Where do I access Calendars? What do I need to use Calendars? Only objects that have at least one Date/Time field will be available as an option to display records within a calendar view. You can add links to edit each record with a form or view more details about each record. 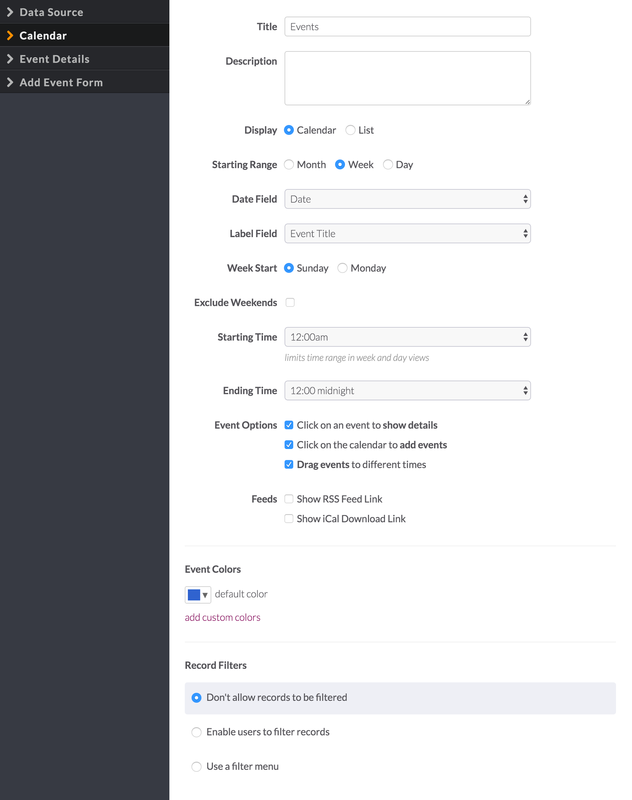 You'll also have options to display any connected records if the calendar object has any connections to other records. 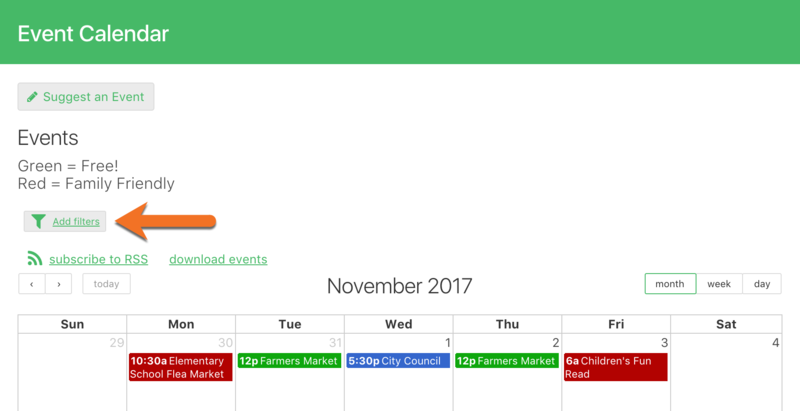 New calendars will default to use the first date/time field as its source to display records in the calendar, the first short text field as the label by default, and the first six fields for displaying popup details. The calendar will open in "edit" mode where you can use the menu on the left to edit different aspects of the calendar. Warning: Please note that deleting a calendar view will also delete any link/child pages directly connected to it. Data: the calendar will display all the object's records by default. Use the data section to add rules to limit which records will be displayed. Limit: show all the available records or limit to a specific number. Click here for more on working with the data source. Title & Description: optional copy you can display above the calendar to add any necessary instructions or explanation. Display: Calendar or List. The Calendar option is the default choice here when using a typical graphical interface. The list option lets you display as rows of text but still lets you navigate by different ranges (days/weeks/months). Starting Range: the calendar has options to display in multiple date ranges: by month, by week, and by day. 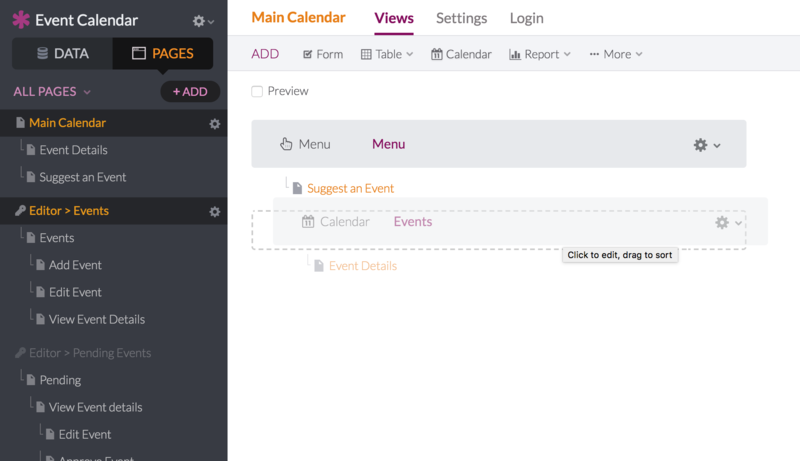 The user will be able to change which range they display the calendar in. This selection sets the starting range. Date Field: select a field that the calendar will use as the date to place each event on the calendar. This field must be Date/Time type. Label Field: select a label field that the calendar will display along with the date on the calendar. Choose a title, name, or any other field that can easily identify the whole record. Week Start: select if you want the week on your calendar to start on Sunday or Monday. Exclude Weekends: check this option to remove weekends from the calendar. Starting & Ending Time: limits the time range in week and day views. 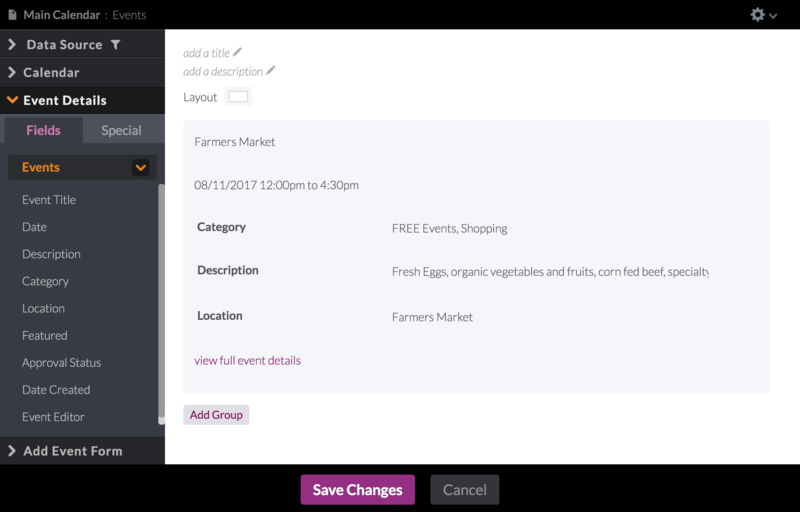 Show Event Details: when activated, the user can click on each event to view more details about that event in a popup window. See the Event Details section below for formatting this popup. 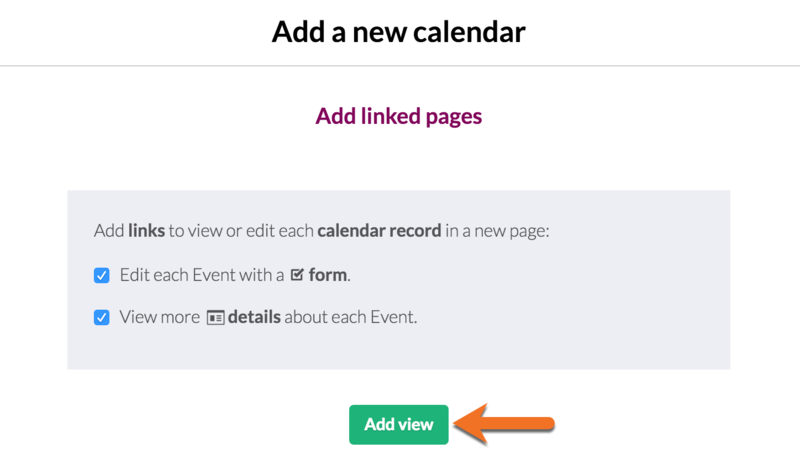 Allow Event Adding: when activated, the user can click on a day in the calendar to add a new event. The date field will default to the day that was clicked. 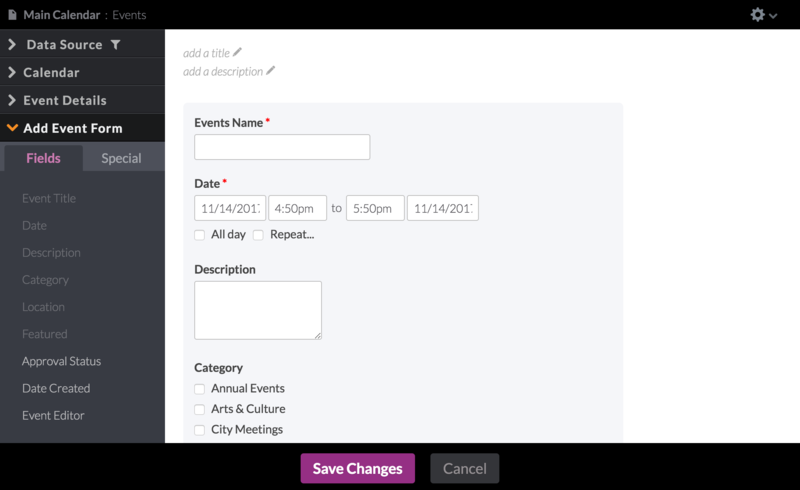 See the Add Event Form section below for formatting this form. Allow Event Dragging: when activated, the user can drag an event and move it to change the date, time, and duration. RSS: an RSS feed can be subscribed to and will automatically update events in an RSS feed reader. 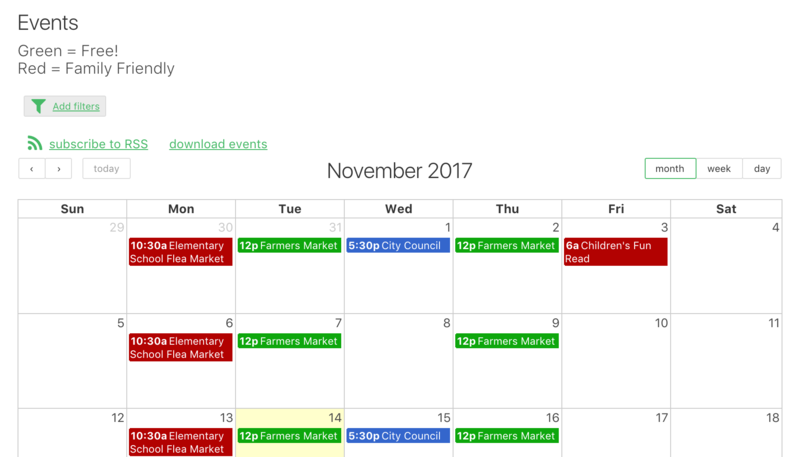 iCal: a downloadable format that can be used to import the current events into another calendar service.Only the date/time and label field values will be included. 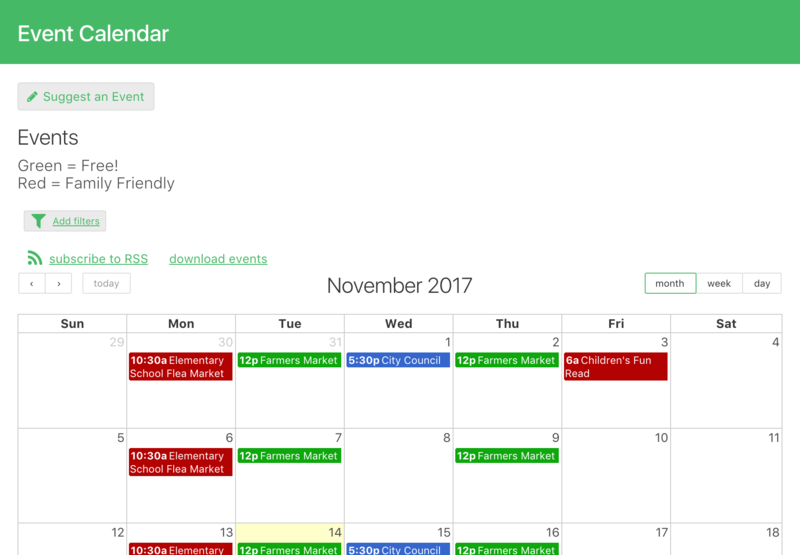 The iCal download/URL of your calendar events will include only the upcoming and previous six months of events, based on the date you download the events. The iCal format will also not update with new events automatically from your App to the secondary calendar. Note: The feed will not work if it's meant to show records connected to the logged-in user, or similar. Only the date/time and label field values will be included. Knack Tip: You can sync Knack calendar events to a Google calendar by right-clicking the iCal download link (on your Live App calendar view) and selecting the "Copy Link Address" option. 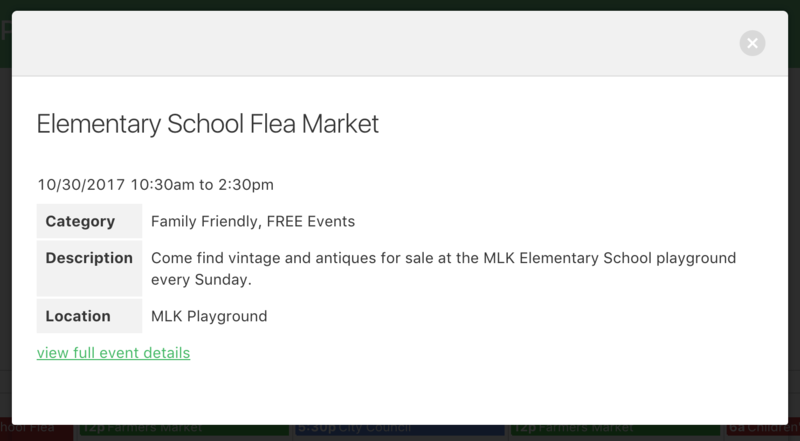 You can then paste that URL into the “Add by URL” option in the Other Calendars section of your Google Calendar. If you get an error, "We could not parse the calendar at the URL requested. ", it likely is due to the file size of your iCal .ics file. Google recommends a file size of less than 1MB, so the number of records or other filters may need to be applied to keep the file size under that limit. Event Colors: add rules to display events in different colors based on criteria you add. Record Filters: filters give the user tools to further refine which records the calendar will show. You can add filters as options for the user to add, or as a menu. The calendar will update as soon as a filter is added. Multiple filters can be added as needed. You can determine if the fields available to filter are limited to the calendar details or all the object fields. You can add preset filters that will initially filter the records. 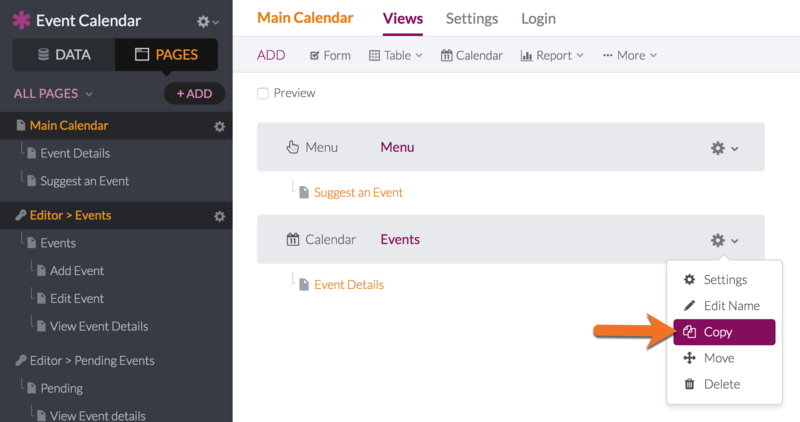 Filter Menu: Enabling a filter menu will present links above the calendar the user can click that will filter the records based on the rules you create. Click here for more on managing details. If your calendar is configured to allow new records to be added when the calendar is clicked, you can manage the form inputs here. This follows the same model as the Form view. Click here for more on managing form inputs. When using a Date / Time field with calendar options turned on, and the end date is set before the start date's value, the calendar will utilize the end date as the start date, and vice versa. If a calendar view is set to default display the month view, on the Add Event Form in the Live App, the "All Day" option will be default checked. Week and day view displays of a calendar view do not have the "All Day" option default checked when adding a new event.